While cooking in the Instant Pot, the most convenient part is that you don’t have to baby sit it. You just have to add the ingredients into the pot, set the time and pressure and just walk away. Once it’s done it will beep and you can either do a quick pressure release or natural pressure release based on what you are cooking. After NPR, it goes into warm mode and will keep your food warm for hours. When you are doing slow cooking, IP is perfect, by the time you want the food it will be ready and warm in the IP. Cooking Basmati rice is a breeze in the Instant Pot, every time you will have perfectly cooked and fluffy rice. Different rice has different cooking time. Basmati rice after being soaked for 10 minutes is ready in just 8 minutes with QPR. 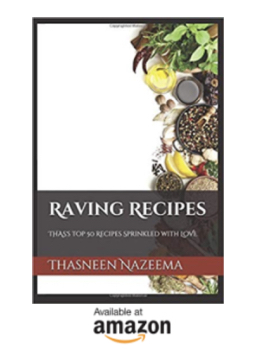 Recipe for making Instant Pot Brown Rice, click here. 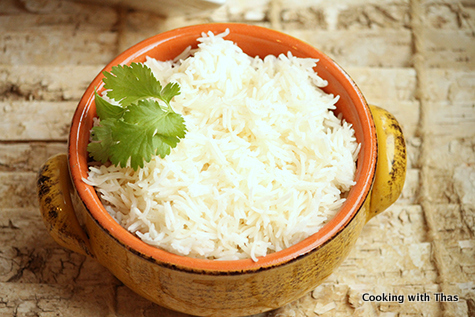 Soak the basmati rice in 2 cups water for 10 minutes. After 10 minutes of soaking, rinse the soaked rice under running water. Soaking rice is optional. Into the stainless steel pot, add the rinsed rice, water and salt. For softer rice, the ratio for rice:water is 2 cups: 2½ cups (not 1:1 ratio, ½ cup more water is added). If using 7 in 1 DUO: Close the lid, make sure the knob on the lid is turned to Sealing. Click Manual and set pressure to high pressure. Set time to 8 minutes (by clicking + or - button). If using Ultra IP: Close the lid. Select pressure mode, high pressure, set time to 8 minutes. After pressure cooking, lets do a quick pressure release. 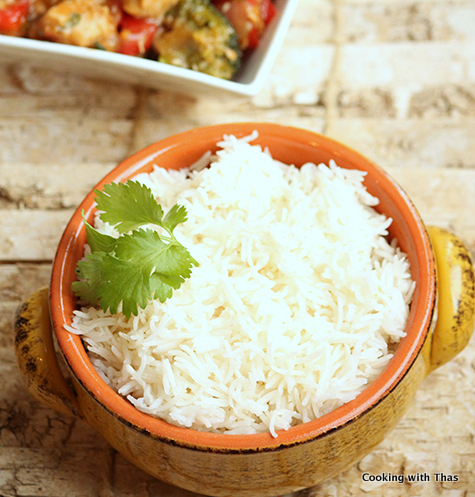 Fluffy and perfectly cooked basmati rice will be ready. You can can have the rice with any kind of curries, stir fries or make fried rice out of it.